A little bit of history, our statutes, board members, team and our member organizations. The mission of Ecopreneur.eu is to pursue advocacy activities with an influence on sustainable development and the green economy, advance the interests of green SMEs and green economy projects across Europe, and work towards improving environmental standards. The organisation currently holds five associations from different EU member states: UnternehmensGrün (Germany), Grüne Wirtschaft (Austria), Entreprendre Vert (France), MVO Nederland (Netherlands) and SEA (Belgium). Through Ecopreneur.eu these associations strengthen the voice of sustainable business in Brussels. Under the roof of Ecopreneur.eu, more than 3000 sustainable businesses are represented – mostly SMEs. The companies are all committed to delivering sustainable products and services in order to solve societal challenges and mitigate climate change, and support the transformation of the current economic system. Ecopreneur has a focus on circular economy and sustainable finance. Click here for a 4-pager on Ecopreneur and here for a 3-pager on our Circular Economy Advocacy Group. The European Sustainable Business Federation is the only cross sectoral business organization advocating ambitious implementation of sustainable economy policies to achieve systemic change at the EU level and in the member states. 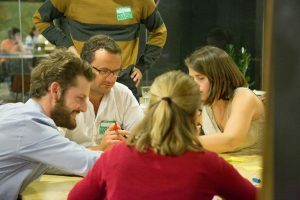 On the initiative of Grüne Wirtschaft (Austria), Entreprendre Vert (France) and UnternehmensGrün e.V. (Germany), Ecopreneur.eu was founded. In 2016 Ecopreneur.eu acquired official legal status as an “association internationale sans but lucratif” (aisbl), a non-profit non-governmental organization under Belgian law. WHO IS WHO AT ECOPRENEUR.EU? The team of Ecopreneur.eu – consisting of board members, experts and management – work closley together to help set framework conditions on EU, national and regional level for a sustainable economy. Keep up to date on all the latest here! Ecopreneur.eu and the Circular Economy: What is happening in Brussels?